Wainscott is a small village in the Hoo Peninsular, in Kent. It is in the civil parish of Frindsbury Extra, in the Medway Unitary Authority, that is Medway Council. By 1950 it had been absorbed into the neighbouring residential areas of Strood. 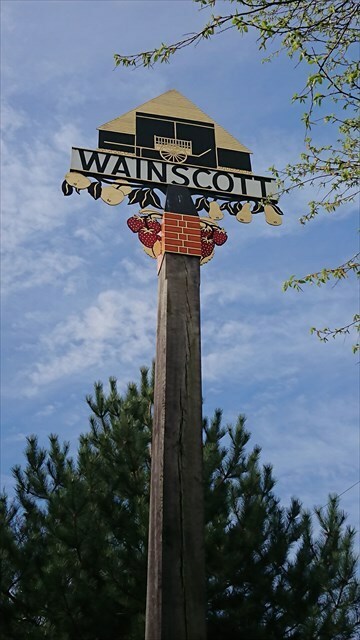 Wainscott itself is located immediately next to Frindsbury, and is surrounded by beautiful agricultural land, as well as ancient woodlands. It is speculated that the name is derived from the OE meaning Wagonner Cot or Wagon Shed. To find the cache you will need to go to the sign, Number of metal clips on the grey slabs that line the footpath between the two roads =A, B, Number of strawberry's on the sign = C, Number of leaves on the bottom of the sign = D,E. N51 24. (B-E)(A+C)D E000 30.(C+E)(C+D)(B-D). THE CHECKSUM FOR THE CO-ORDS IS 50.